During the Mi’raj, the Prophet(P) is reported to have received from God the command of five daily prayers (salah) that all Muslims must perform. Upon his return to Mecca, the Prophet instituted these prayers. 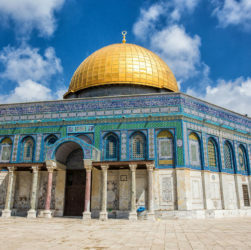 It is significant to note that he made Jerusalem the direction (al-Qiblah) which Muslims must face while doing their prayers (narrated by al-Bukhari, 41 and by Muslim, 525). 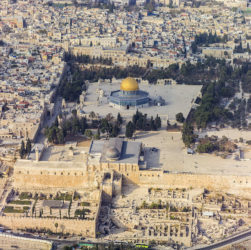 Jerusalem is thus called Ula al-Qiblatain (the first qiblah). The Prophet (P) and the early community of Islam worshipped towards the direction of Jerusalem during their stay in Mecca. After the Hijra’ (migration), Muslims in Medina also continued to pray facing Jerusalem for almost seventeen months until God commanded the Muslims to change their direction of prayer from Jerusalem to Mecca (Qur’an 2:142-150). These established facts clearly signifies the importance of Jerusalem in Islam.